With 50g of protein per brownie, along with PhD's own slow burning carbohydrate ingredient: Waxy Vol, plus Glutamine Peptides. Growth Factor 50 does not contain an overabundance of Polyols, so the bar is very easy to digest without causing too much gastric discomfort. Growth Factor 50 also contains 6G of MCT oil per brownie. Containing a 2:1 Protein: Carbohydrate ratio. Deliciously decadent and designed for serious athletes, what more could you ask for? Each bar is 100g. Milk Protein, Chocolate Flavour Coating (15%) (Sugar, Vegetable fat (Palm oil), Cocoa powder, Flavouring, Emulsifier (Soya Lecithin)), Hydrolysed Wheat Protein (12%) (providing peptide bonded L-Glutamine), Humectant (Glycerine), Hydrolysed Gelatine, Soy Protein Isolate, Medium Chain Triglycerides (MCT’s), Water, Cocoa Powder, Waxy Barley Flour (2%), Dietary Fibre (Acacia Gum), Flavouring, Sweetener (sucralose), Green Tea Extract. 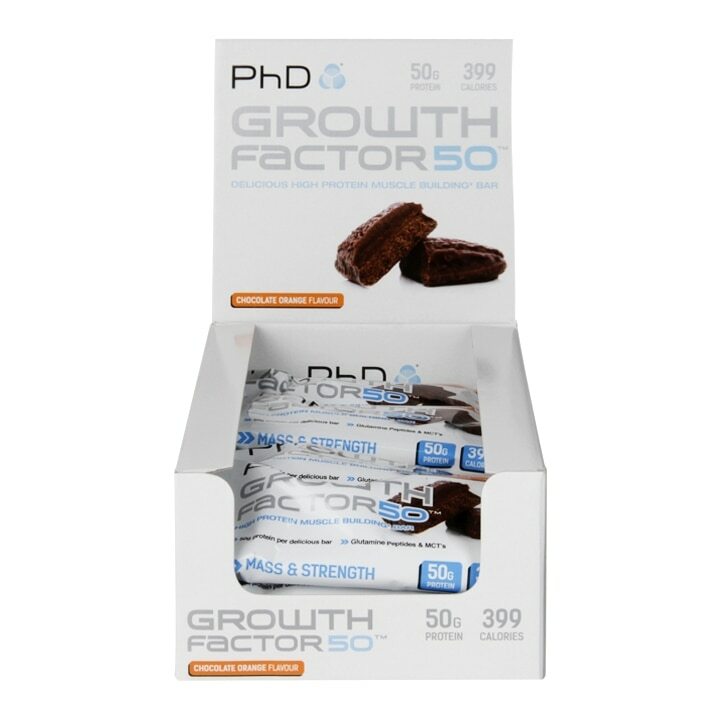 PhD Growth Factor 50 Chocolate Orange is rated 5.0 out of 5 by 1.